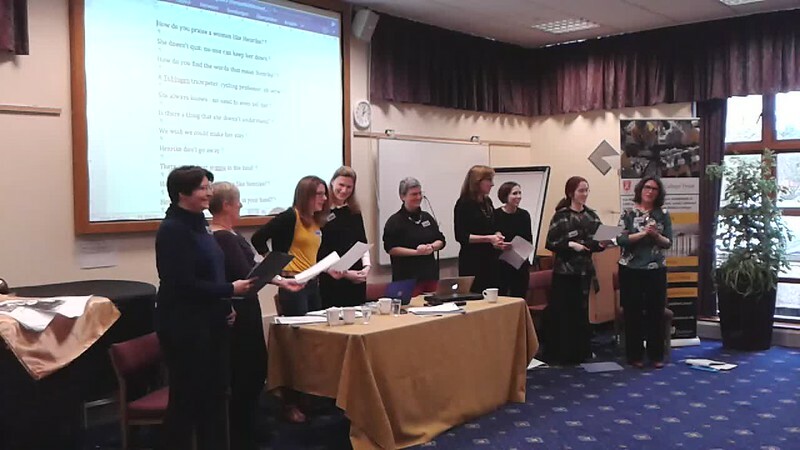 Earlier this month Wiggies from around the UK and Ireland made their way to Durham for the WIGS 27th Annual Conference. As ever it was an opportunity to listen to some fantastic papers, to catch up with fellow Wiggies and meet new Wiggies in the wonderful environment of Durham’s Van Mildert College. The conference started off on the afternoon of 6th November, as usual with a Postgraduate workshop, with this year’s theme being ‘Working with Visual Culture and Displaying Visual Culture’. 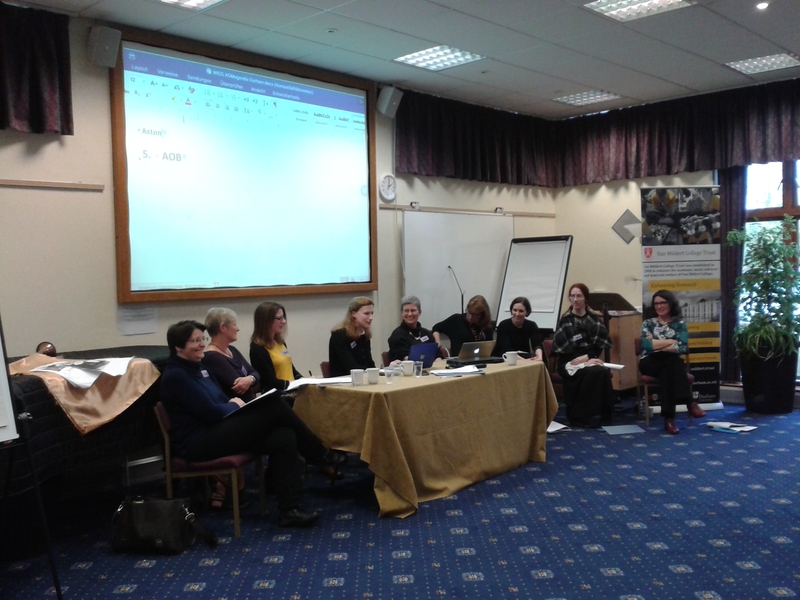 The workshop, chaired by Janet Stewart (Durham), featured presentations from postgraduate WIGS members, and was greatly enjoyed by all participants. Following the Postgraduate workshop, it was time for the WIGS Prize-Giving ceremony, where the WIGS Postgraduate Essay Prize (now in its second year) and the inaugural WIGS Book Prize for First Books were awarded. As the shortlisted candidates for the WIGS Book Prize could not attend the ceremony in person (understandable, as one of our finalists would have had to travel from New Zealand and the other from Hamburg), delegates watched pre-recorded presentations by Sally-Ann Spencer and Marissa Munderloh, followed by laudatios of the individual book proposals by members of the WIGS committee. 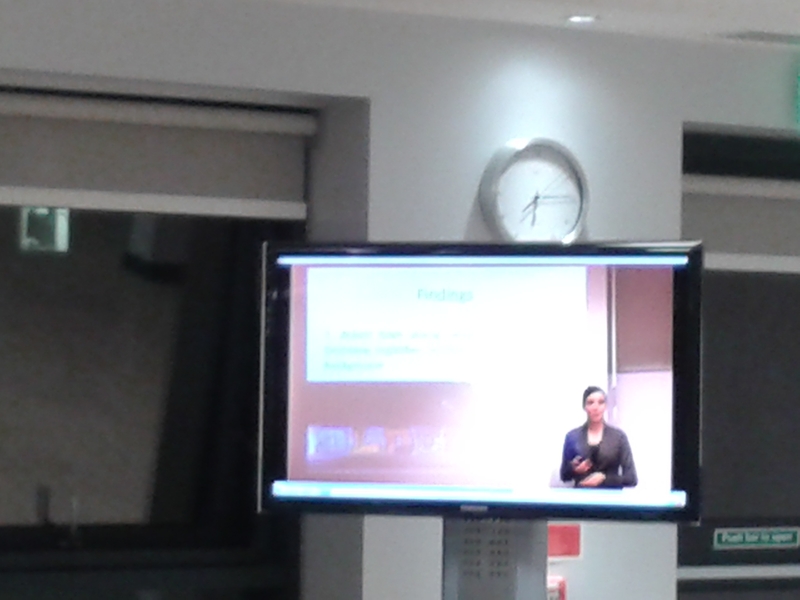 Readers will be pleased to know that the presentations will soon be made available on this blog – watch this space! Marissa Munderloh giving a video presentation of her book proposal on ‘The Emergence of Post-Hybrid Identities: A Comparative Analysis of National Identity Formations in Germany’s Contemporary Hip-Hop Culture’. Books Across Borders in the Digital Age’. We were pleased to announce that Sally-Ann Spencer had been awarded the inaugural WIGS Book Prize for a book proposal on Contemporary German-English Translation: Books Across Borders in the Digital Age. 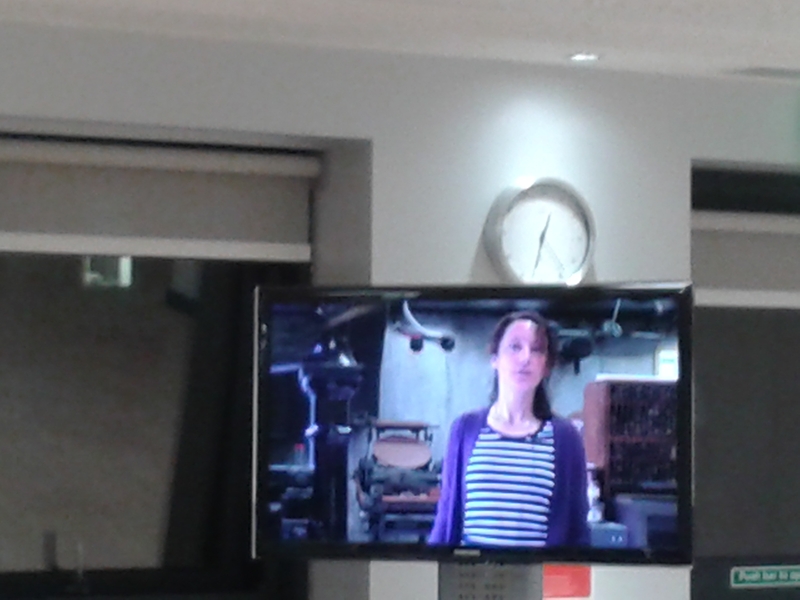 Laurel Plapp, Commissioning Editor at Peter Lang Publishing (who are generously supporting the WIGS Book Prize), was able to present the prize virtually to Sally-Ann, who was skyping in from Wellington, New Zealand (where it was 7am in the morning!). 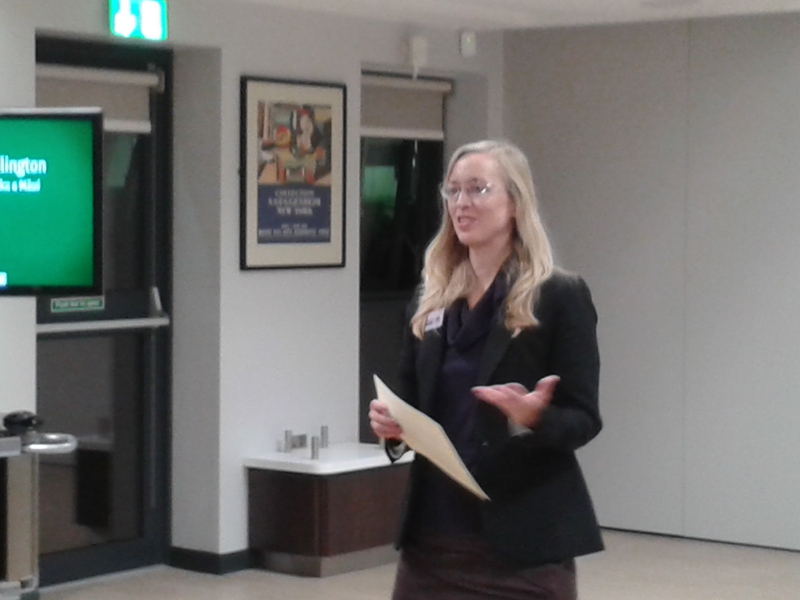 Laurel Plapp, commissioning editor at Peter Lang Oxford, announcing the winner of the inaugural WIGS Book Prize. Next, it was time for the award of the WIGS Postgraduate Essay Prize. We heard Ellen Pilsworth give a wonderful presentation of her winning essay on ‘Literary Role-Play in the War Poetry of Anna Louisa Karsch’, followed by a laudatio of the essay by Henrike Lähnemann. We look forward to reading Ellen Pilsworth’s essay in a future issue of German Life and Letters, who are generously supporting the WIGS Postgraduate Prize. Incidentally, you can now read Ina Linge’s essay (which won last year’s inaugural WIGS Postgraduate Essay Prize) as an article in the July 2015 issue of German Life and Letters. 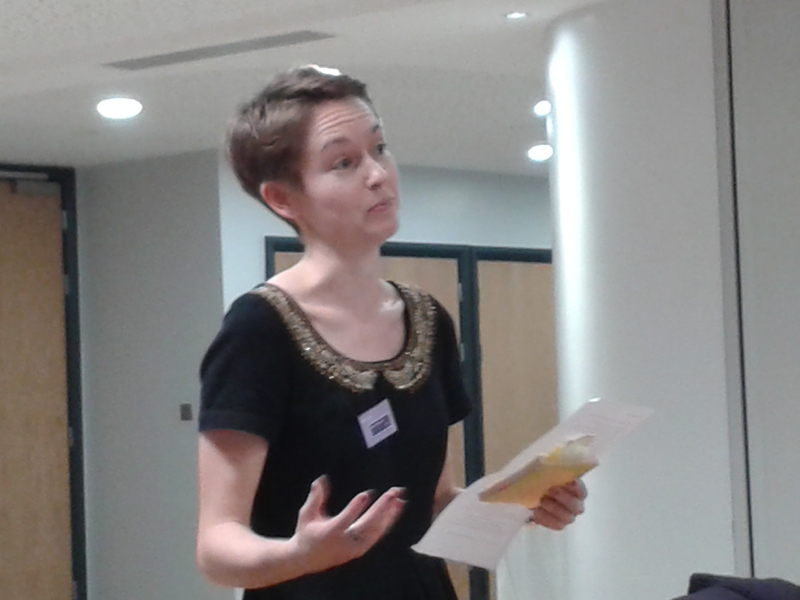 Ellen Pilsworth giving an overview of her winning essay on ‘Literary Role-Play in the War Poetry of Anna Louisa Karsch’. Following the prize-giving ceremony, it was time for the conference dinner, which was a lovely occasion as usual. 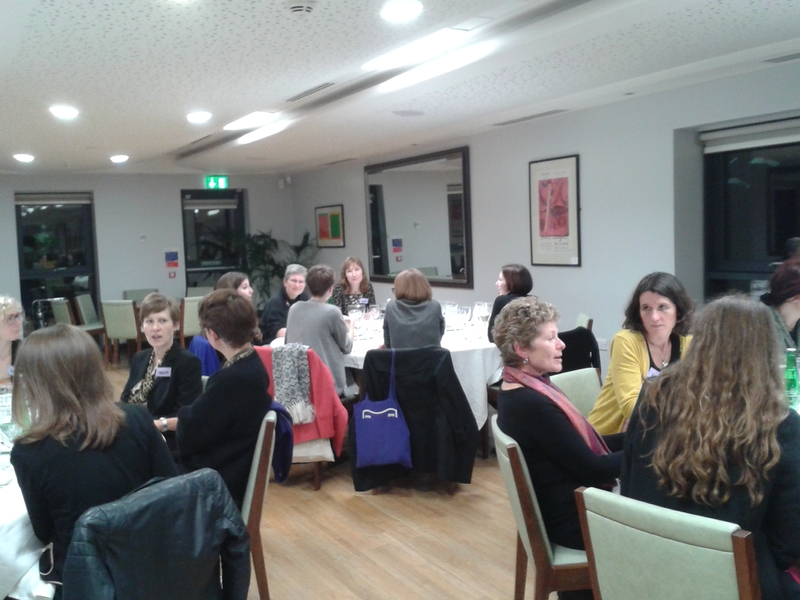 Delegates enjoying the conference dinner. The following morning heralded a day full of stimulating conference papers. There were panels on Life Writing, Memory, Post-war Culture, Contemporary Film and two panels on Weimar culture. In between all of this, we paused for lunch, when the sun briefly reappeared again and shone on the beautiful lake at Durham’s Van Mildert College. Following lunch it was time for the WIGS AGM. The WIGS committee, from left to right: Birgit Mikus (Early Career rep), Brigid Haines (incoming WIGS Chair), Madeleine Brook (IT coordinator), Katya Krylova (Secretary), Henrike Lähnemann (outgoing WIGS Chair), Caroline Bland (Treasurer), Cyd Sturgess (Postgraduate rep), Simone Schroth (Part-time and Freelance rep), Gillian Pye (Irish members rep). I know that those of you who were unable to attend the conference, will join me in warmly thanking Henrike for everything she has done for WIGS over the past six years, and warmly welcoming Brigid as new WIGS Chair. 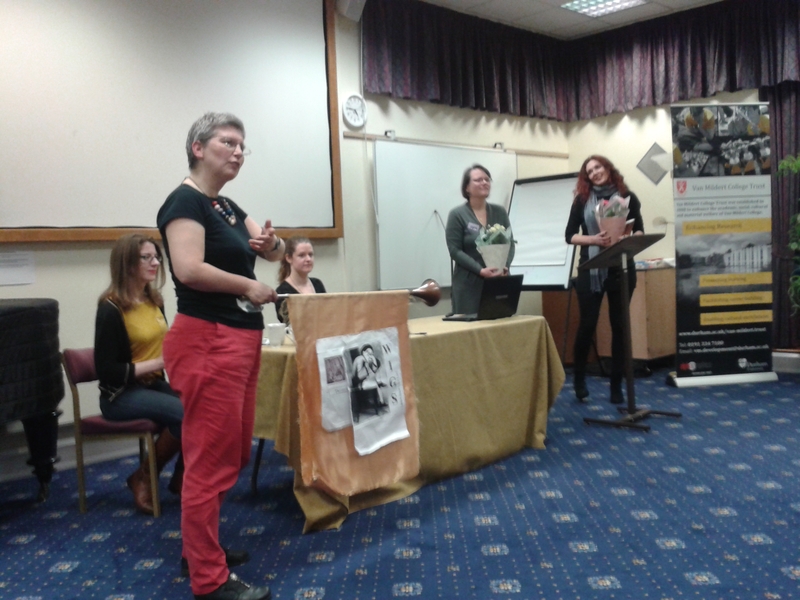 The day concluded with warm thanks to conference organisers Marie Isabel Matthews-Schlinzig (Durham) and Tracey Reimann-Dawe (Durham). Thank you so much, Isabel and Tracey, for all your hard work in organising and hosting the conference! Conference organisers Marie Isabel Matthews-Schlinzig and Tracey Reimann-Dawe being thanked by Henrike Lähnemann and delegates. That was #WIGS2015! We look forward to seeing you in Aberystwyth in November 2015, for the WIGS 28th Annual Conference! Posted on November 14, 2015 June 5, 2018 by Katya KrylovaPosted in Conferences, General, NewsTagged Durham 2015, Prize Award Ceremony, WiGS AGM, WiGS Book Prize, WiGS Postgraduate Essay Prize, Women in German Studies Annual Conference. Previous Previous post: ‘Thesis of the Month’ goes to Lizzie Stewart!